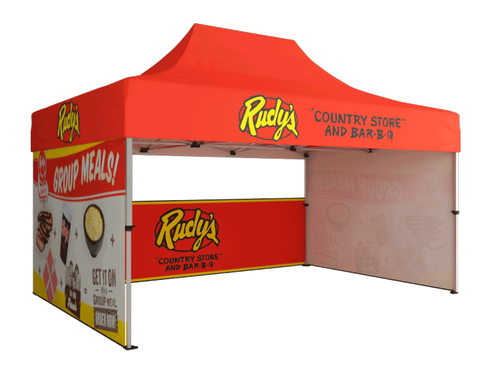 Accessories can take your trade show booth from basic to bold while still staying in budget. Start with the necessities like trade show flooring tiles or literature racks, and go bigger with TV stands, Shelving Solutions, or Hanging Signs. Here you can also find more add-ons like table throw covers, parts and components for your existing frame, or additional design services. WHAT SHIPPING METHOD DO YOU USE FOR THE FREE SHIPPING PROMO? Our Free Ground Shipping promotion for orders over $1000.00, covers FedEx or UPS Ground shipping to all 48 states in the continental US. To better serve our customers, we warehouse products across the United States, allowing most orders to generally arrive anywhere in the country in 2-5 business days after the production or lead time. Note that there may be additional shipping charges for other products, and/or Rush orders.